Synopsis: Spared and Spoiled is a Better Angels campaign, the game where the only secret more sacred than a supervillain’s identity is the fact all those powers come from demonic possession. The adventures begin when the ViShrock, a family of thirteen hellspawn, possess the faculty and students of The Brighter Futures Academy. The characters have to figure out why they were targeted to become hellbinders, use their newfound powers to save the school, and try to survive the academic year without getting killed or eternally damned. 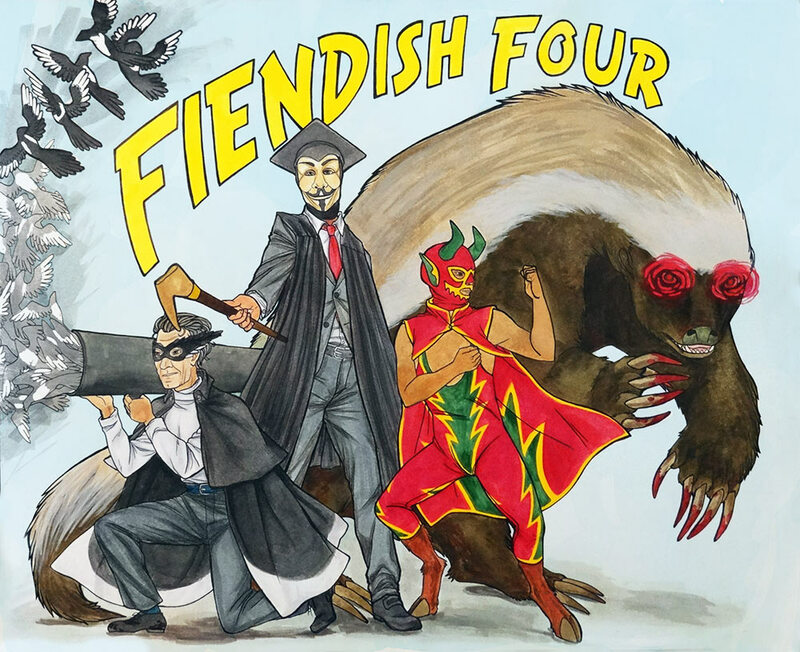 They become the newest supervillain group: The Fiendish Four! The APs of this campaign represent the initial playtest of what became No Soul Left Behind, the first sourcebook for Better Angels. Episode 1 – Triskaidecka: Meet the cast of the Brighter Futures Academy…just in time to see them traumatized by the Midwest’s Premier League of Evil: the dreaded Triskaidecka! When the baker’s dozen of supervillains makes an unexpected exit, the characters find themselves suddenly hosting some infernal exchange students and fighting for their lives. Episode 2 – Think of the Children Part 1: We fire the orbital retcannon, erase three players, add in two more, and figure out how to work the recorder. There’s also some game in there somewhere. The school will be shutdown if the players can’t raise enough money to pay for repairs. To get the funds, they’ll have to moonlight as supervillains under the tutelage of Error Margin, the last surviving member of Triskaidecka. Episode 3 – Think of the Children Part 2: Overconfident after their first forays into super-crime, the players try their hands at ransoming a brewery. Things…do not go well. Listen as the Fiendish Four are born! Episode 4 – Arts and Sciences: After saving the school through highly illegal, insanely reckless, and utterly amoral means, the Fiendish Four discover they aren’t the only superhumans new to the Brighter Futures Academy. The competition isn’t afraid to use their powers directly on the student body, and the interdepartmental rivalries get bloody. Episode 5 – The End is Nigh…Finally: Swat teams, supervillain fights…what’s next, zombies? Yes, actually. Zombies are up next. Can the Fiendish Four find the necromancer in time to save the city, or will their assumptions get everyone killed? Episode 6 – A New Brand of Justice Part 1: The Fiendish Four have attracted the attention of The Brands of Justice, a team of corporately sponsored superheroes. What’s the group’s real agenda? Can the team defeat a group of experienced crime-fighters while keeping up with the demands of their mortal lives? Episode 7 – A New Brand of Justice Part 2: The corporate superheroes are actually super-duper evil! Who could have guessed? (besides everyone) The Four have to figure out a way to exploit the weaknesses and secrets of their enemies if they want to out vigilante the professional vigilantes. Episode 8 – The Performance Gap: Some people are incorruptible. Others were assholes long before demonic possession. And a select few, like the Four, have to deal with the fallout from both. Can the group scare off their competition in organized crime and assist in an exorcism at the same time? Episode 9 – The Ministry of Strength: The events of the year have attracted a trio of cherubim to lay a righteous smackdown on the Fiendish Four. The group has to fend off a group of angelic powerhouses while facing an even greater evil stalking the halls: standardized testing. Episode 10 – The Gospel According to Terror Track: It was in inside job! The betrayer of Triskaidecka is finally revealed, but can the group track down the Judas before his soul is buried far beyond their reach? They’ll have to overcome theological murder mysteries, devilish deathtraps, and sibling rivalry to find out. Episode 11 – Missionaries of Dinner: The Fiendish Four have discovered an insidious plot that will devastate the world if they don’t intervene. To foil the plot, they’ll need to infiltrate the deepest circle of bureaucratic hell: the state legislature. Episode 12 – The Enemy of my Enemy is my Temporary, Begrudging Ally: The Fiendish Four have finally identified the villain responsible for all their problems. Can they stop him without damning themselves in the process? Find out in the dramatic conclusion. Spared and Spoiled Postmortem: Listen to the whole crew recount their favorite moments of the campaign, discuss the story’s origins, and talk about the upcoming Kickstarter for No Soul Left Behind. The Kickstarter for the new-and-improved The Spared and the Spoiled is up today! Pledge and get your own copy of the 200+ No Soul Left Behind!